Israel's Chief Rabbis Yona Metzger and Shlomo Amar have received death threats following the haredi objection to egalitarian prayer at the Western Wall plaza. A letter sent to the two rabbis' officers, titled "This is a last warning," stated: "If the Women of the Wall are not allowed to pray according to our ways and custom, we will fight you with all measures, and you will return home with 100 bodies of haredim. Your end is near, you stinky, disgusting parasites." The paper included a picture of a gun with the caption, "We will no longer practice restraint. We will re-liberate the Western Wall." Ynet has learned that the rabbi of the Western Wall and holy sites, Shmuel Rabinowitz, received a similar letter and has been put under tight security in recent days. Chief Rabbinate CEO Oded Wiener handed the letter over to the security officer of the Prime Minister's Office, who is responsible for the security of the chief rabbis, and asked him to work to expose the senders of the letter as soon as possible. Rabbinate officials said whoever sent the letter had crossed a red line. "This is the first time the chief rabbis receive death threats, and unfortunately in the State of Israel we have learned that words can kill. 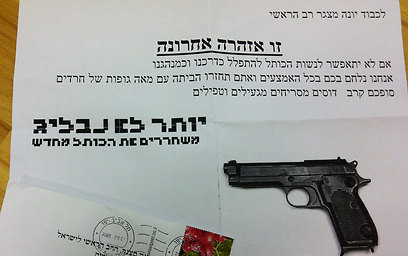 We are not just talking about threats on the rabbis, but on an entire public, using blatant language. We hope the police judge the instigators severely," one of the officials stated. The Women of the Wall organization commented on the threatening letters sent allegedly on its behalf, saying in statement: "We regret to hear the expressions of violence and threats directed at the chief rabbis today. Any sensible person understands that the Women of the Wall had nothing to do with the act and that the style of these letters does not match the love of Israel spirit led by the group. "We support the police in their investigation of this incident and elimination of any expressions of violence," the group added. Knesset Member Eli Yishai (Shas) said in response to the threatening letters that "the radicalization against the haredi public has crossed every line, and it's apparently just a matter of time before we see its results. "This letter could not have been sent without the fertile ground encouraging the tongue-lashing and incitement against haredim recently. The police must do all they can to find those who made the threats and prosecute them. "The battle mongers, some of whom hold public positions, must consider their words and actions in a more reasonable and responsible manner, before we witness incidents in which explanations and apologies will no longer be helpful," said Yishai. The Israel Movement for Reform and Progressive Judaism commented on the threats as well, expressing its objection to any expression of physical or verbal violence. "Throughout the years, the battle for freedom of religion in Israel has been run in a proper and non-violent way, and we have no doubt this will continue in the future," the movement said in a statement. "The only response to the attempts to restrict the Women of the Wall is the arrival of thousands of female and male citizens to the Rosh Chodesh (beginning of the Hebrew month) prayers in a respectable and quiet manner." Meanwhile Monday, the Chief Rabbinate Council released the interim decisions made at a discussion on Jewish Agency Chairman Natan Sharansky's outline, which seeks to divide the Western Wall plaza into three equal sections: Men, women and a mixed public. "In its decision, the Council rules that as long as the Chief Rabbinate has not delivered its decision on this matter, no changes should be made and the Western Wall must be treated like the sanctity of any synagogue," the Council said in a statement. The Council added that it "rejects any act of provocation and any violent behavior on any side, and appeals to the parties to practice restraint until a decision is made on the matter in order to allow a proper discussion." As for the outline, the Council said it was waiting for the decision of Sharansky and Deputy Minister of Religious Services Eli Ben-Dahan on the matter before making a decision. Two weeks ago, vandals spray-painted threats on the apartment door of an executive board member of the Women of the Wall organization, Peggy Cidor, in what seemed to be a haredi version of the "price tag" acts against the liberal female worshippers. Entitled "Torah tag," the graffiti read: "Peggy, you're the first. We know where you live. Jerusalem is holly. The Western Wall would not be forfeited. The Women of the Wall are villains." Jerusalem Mayor Nir Barkat strongly condemned the incident, saying it a violent act in the full sense of the word which should be treated stringently by the proper authorities. "The way to resolve disputes in the city is not through violence, but through dialogue and reaching an agreement addressing the needs of all parties," the mayor said. See all talkbacks "Chief rabbis threatened over Kotel war "